A Campaign by Invisible Children called Kony 2012 has spread viral among all social networks pretty much overnight. A viral film was created to end the conflict in the Uganda war and to help raise awareness about the human rights abused by Joseph Kony. Joseph Kony in Uganda has abducted more than 66,000 children in Central Africa and forced them to be child soldiers in his Lord’s Resistance Army. Filmmaker, Jason Russell created a 30 minute YouTube video that he released on Tuesday, March 6, 2012 about Kony. The YouTube video has over 4.2 million views. Joseph Kony has been indicted for war crimes by the International Criminal Court (ICC). He needs to be captured and arrested. In order for Joseph Kony to be arrested this year, 2012, the Uganda military has to find him. In order to find him, they need the technology and training to track him in the vast jungle. That’s where the Amercian advisers come in, but in order for the American advisors to be there, the US government has to deploy them. If the government doesn’t believe the American people care about arresting Joseph Kony, the mission will be cancelled. How do you show that you care about Joseph Kony being arrested? The government will know by seeing Kony’s name everywhere. Invisible Children are going to target 20 culture makers and 12 policy makers. What does that mean? The 20 culture makers include celebrities, athletes and billionaires. All that have a voice that when people hear a topic those celebrities are talking about, it spreads, instantly. They will be targeting the 20 of the most diverse, most influential culture makers to speak out about Kony 2012 and make him famous to stop him. Next, to target policy makers who have the power to see Kony captured. They are the ones who decide whether the American advisors stay or leave Uganda. No matter which side you take in this election year, this is something we all should agree on. When citizens make hundreds of thousands of calls to congressmen and senators on a single topic and demand something to be done, it becomes a national interest for the United States government to respond to the issue. The Invisible Children are making it a point to get people to ask, who is Joseph Kony. They have printed hundreds of thousands posters, stickers, yard signs and flyers. They have created thousands of Kony 2012 bracelets that have a unique id number. The Kony 2012 bracelet id number can be input on the Invisible Children website to enter the mission to make Kony famous. 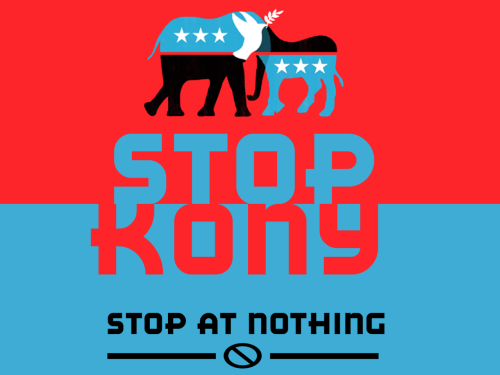 Joseph Kony 2012 Action Kit was created for everything a person needs to help with the Stop KONY 2012 campaign mission. The Kony 2012 action kit includes, 2 bracelets, Kony 2012 T-shirt, action guide, stickers, Kony 2012 button and Kony 2012 posters. On the night of April 20, 2012, the Invisible Children campaign has planned a “Cover the Night” where the volunteers are meeting at sundown to hang posters in all streets in all cities. Can someone please tell me where to input the id number?